The “Run Aion” feature will launch the 64-bit automatically if it detects you are using a x64 windows. This is a bit rushed as I intended to publish this version a bit later with some more fixes and changes, but today the new European publisher Gameforge took over, and their launcher does something extremelly annoying: it auto-checks and updates files by default without asking; by doing so, it replaces my Japanese voice pack and redownloads the English voices everytime. So I added a new feature to ARM that I wanted to share: ability to run Aion without the launcher, so your files won’t be touched. Chanter promise/blessing of wind and cleric promise of wind are now recognized also for other players than your own, as long there is only 1 of the class in the players list displayed. 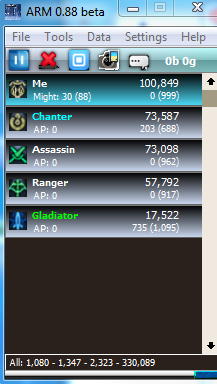 Most Auto atk/pvp hits are now being registered. The damage parsing code has gone through a major rewrite, now recognizing both asmo/elyos random additional rune dot (blood/darkness rune), and lots of improvements in a siege scenario. Cleric servants and most dots are now limited to a certain amount of hits per caster/mob, taking into account the summoning order. This should help make siege data a lot more accurate (though still far from perfect). G15 code rewritten; the code to generate every frame display was taking around 200 ms, causing heavy flickering; it’s now reduced to 20-25. Added “Tools/Run AION (Europe)” to run Aion without the launcher. (only for european clients). 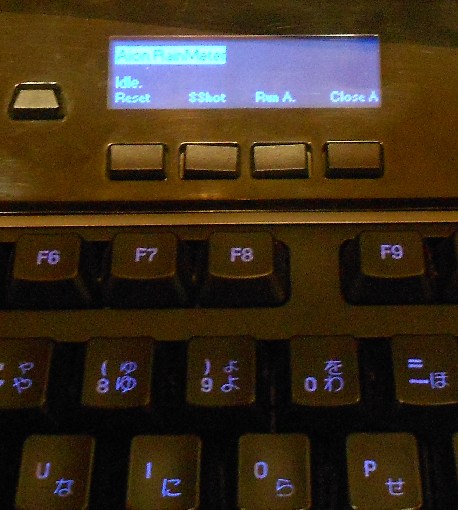 Added Run/Close (Aion) buttons to the G15 LCD. Updated hacker list for telemachus and cheating apps detection. Most messages are now displayed through a balloon in the tray icon. Fixed an issue where screenshots taken with ARM ended up blank. Fixed data copy, it was showing incorrect information for godstones combined damage. Added a benchmark option under Help/benchmark. Added timestamps to the chat window. Added a “virtual” player, “Unknown”, it will appear in the list if the parser fails to recognize some hits. You can see the entire skill list as if it was a normal player. Fixed crits % in the skills list window, it wasn’t calc’ed properly sometimes. Lots of other fixes and performance improvements. There are many other things half-done which I couldn’t finish for this build, expect to see a lot of further improvements in the next update. 1 more update to AionScript detection routine. Updated hack cheater detection code. Changed notification for new versions, you’ll get a tray balloon msg instead. * Added support for private server NotAion Might counter. Whenever you acquire Might (the currency used to buy gear etc) or buy something from the shop, the AP counter in your player display will instead show you the amount of Might you have earned since starting the app, and the total Might you have in brackets (requires acquiring Might first to update the counter). 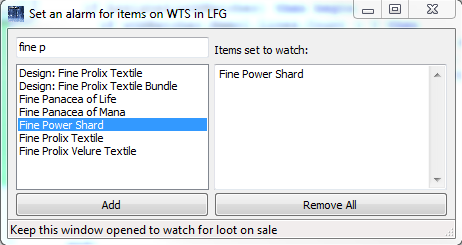 * Added a new tool to set an “alarm” for items you want to buy which players sell in LFG: you set the items you want and minimize the window, whenever someone links any of the items in LFG, the window taskbar button will flash and a notification will appear through the tray icon. You can access the new feature via the Tools menu. Chat features must be enabled for this to work. * Updated Aionscript checker/injection module and log analyzer (checks for weird skill timings in search of hacking players). 0.87 had some issues where it would randomly crash. Redownload it again and it will be fine, the new build has those issues fixed. * Damage from bosses will now be shown if you enable the option “Show damage from misc mobs”. * AP relic count is disabled for players with ninja/scam/hack warnings. * The app will close itself if it has been hex-edited or any of its resources modified, or if it fails to determine the user country based in their IP. * 64-bit version is discontinued starting from this release.